CBT works on the understanding that the thoughts that we have, coupled with the things that we do, directly affect how we feel. We look at our thinking, perceptions and interpretations to see if there are changes that can be made to help us to feel better. We also look at our behaviours - the things we do and the things we don’t do to see how helpful these are and what we can do to change these. CBT is a solution focused therapy, often getting long lasting results in a short space of time. Initially we would meet for a free consultation where We would discuss your needs and how therapy can help. Therapy consists of firstly putting together a map or a model (formulation) detailing how everything fits together and how a persons problems are maintained. This map contains things such as our beliefs about ourselves, the world and other people, our thoughts and our behaviours. We then use this map to guide treatment using various different tools and techniques to enable us to make positive changes. Cognitive restructuring is a term used to describe a variety of ways to challenge and adapt the way we think to make it more realistic and helpful to us. One of the many ways we do this is by evaluating our thoughts to look for their validity. Behavioural experiments can be very useful in helping us test out some of our beliefs, rules and assumptions in an active way. These are collaboratively designed with the Client and therapist and can take place in and outside of the session. Psycho-education is extremely useful in helping a person to gain an awareness and understanding of what is going on for them. This awareness is often a huge catalyst for change. Exposure is a tool used to help us overcome fears that we may have in a gradual and controlled way, this is commonly used with phobias and OCD. Tools to decrease anxiety are widely used in CBT, this includes things such as progressive muscle relaxation, mindfulness and breathing exercises. These are just some of the tools and techniques commonly used in CBT. Everybody’s experience is different, so whats most important is making sure we have a thorough understanding of what is going on for an individual so we can find the most appropriate and effective route in therapy. How is Counselling therapy different to CBT? I also work from a person centred counselling approach. Counselling is usually non directive, and enables a person to work through their issues in a safe empathic environment, with the belief that deep down we know what is best for us. It is less about tools and techniques and more and exploration and processing. 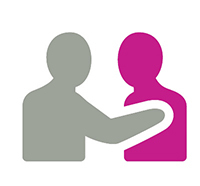 If you need to be able to talk and offload to help you understand your feelings, then a person centred counselling approach can be very powerful. A counsellor will support you in talking through your problems, enabling you to come to your own conclusions and how best to deal with them. Counselling can be helpful when a person needs help coming to terms with something that has happened to them, or with life changes such as bereavement.